Cinghiale has a long tradition of riding in the high mountains of Northern Italy. Andy raced over most of the passes there, and we love to return to take in the glory of the challenging terrain. Our travels are heading east for 2019— we’ll return to the Dolomites for our favorite passes and then head into the Carnic Alps. The journey east is well worth it for the quiet roads and forested scenery. For the riders who love classic Giro d’Italia climbs, but are also looking to explore quieter parts of Italy, this is will be a great adventure. We start the tour from Venice with a short bus ride to Alleghe in the Bellunese Dolomites. Here the passes Duran, Giau, Sella Ronda, among many others, are at our doorstep. From here we will ride over several mountain passes heading east to the Carnic Alps. These wooded mountains are known for the terrifying Zoncolon pass used in the Giro d’Italia. Riders will enjoy the quiet roads through dense forests, clean air, and local foods. This is the Friuli region of Italy, near Austria and upstream from Venice, it has a nice relaxed culture with plenty of challenging terrain. We don’t sugarcoat the fact that this is some stiff riding—experienced riders only, please. Our routes will tackle some of the longest and toughest climbs in the world with very technical descents. That means fun for those experienced enough for the challenge—come fit and prepared and you’ll do just fine in good company. The trip is not well suited for non-riders because we are on our bikes for most of the day. However we have had non-riding guests come who had a great time. Write us if you are interested and we will discuss your interests and see if this would be a good trip for you. 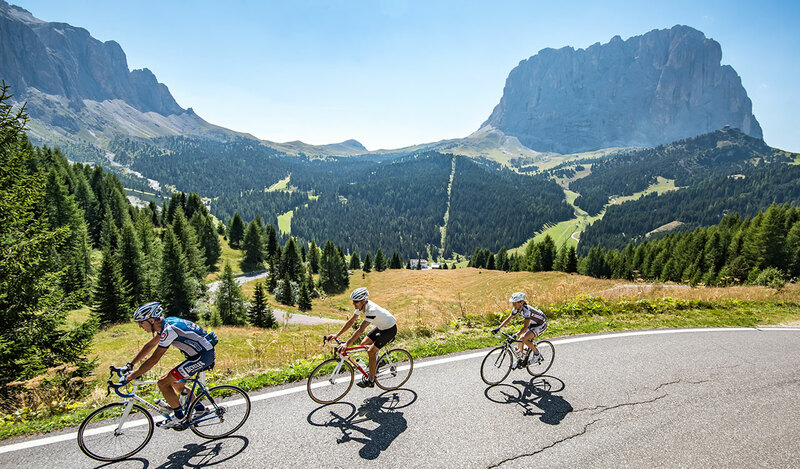 The Dolomites offer long, demanding climbs and blissful descents, while towering limestone crags loom over the dozens of switchbacks we pedal. Culturally we will experience old-school Italy in mountain villages that thrive on winter and summer tourism. The Carnic Alps offer a different mountain feel, with forested mountains extending from Austria and views of limestone and flint trailing from the Dolomites. 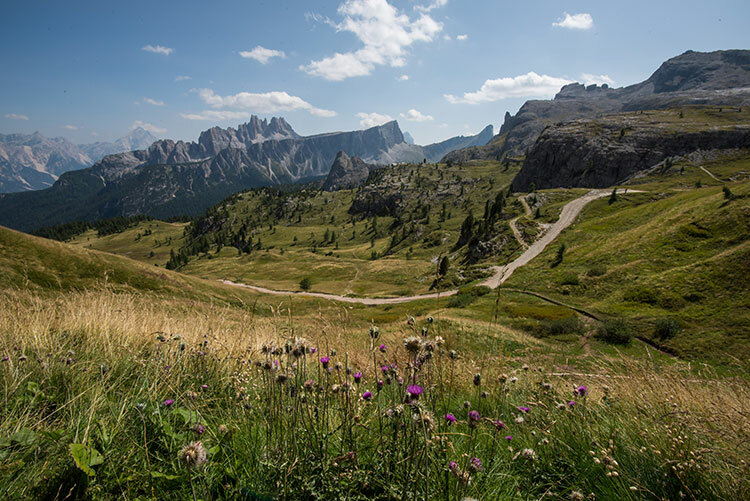 Passes on the itinerary will be selected from the dozens available, including; the Sella Ronda collection (Fedaia, Gardegna, Sella and Campolongo passes), the grand Pordoi, Falzarego, Giau, Duran, Rolle, Valles, Stualanza, and the notorious Zoncolon and Crostis. The Dolomites to Carnic Alps tour begins with transportation from the Antony Palace Hotel in Venice at noon or earlier depending on guest’s arrival times. We will drive to Alleghe to ride for 4 days then, with a long transfer ride, to Ravascletto for 4 days. On our last day we will ride in the morning have lunch and drive back to Antony Palace hotel in Venice to sleep. Guests can then fly out the next day, catch a train to other parts of Italy, or visit Venice. Accommodations prior to the tour must be booked on your own. Our last night 9/8 at the Antony Palace hotel is included in the tour cost. Flights should be scheduled home for Monday Sept 9th and after. Weather: Daytime temps range between 65 and 80 degrees Fahrenheit, but there is always the possibility of harsh weather, especially at the summits, and cool temperatures in the evening. Install lower gears and spin your legs. Your knees just thanked you.